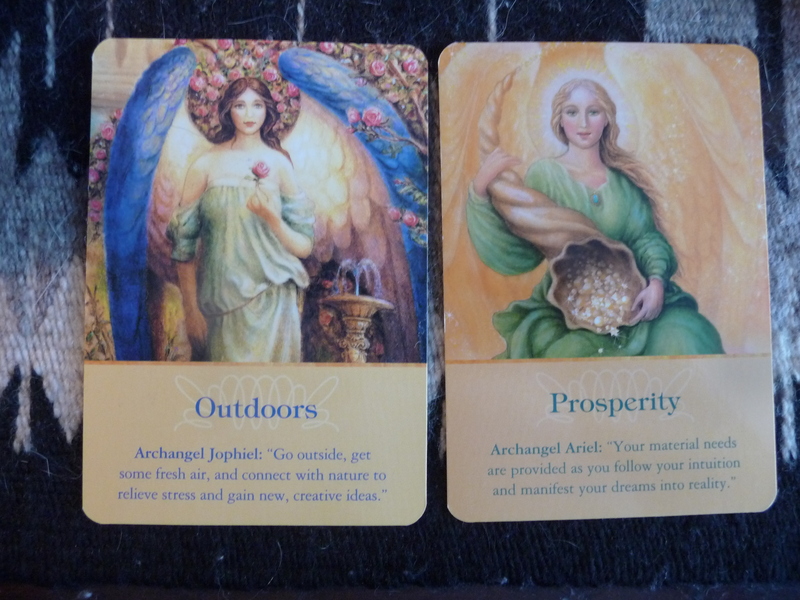 For today’s reading the angelss gently led me to the always beautiful Archangel Oracle Cards by Doreen Virtue, and two cards came out of the deck for you. This is SUCH an interesting combination of messages, and it’s all about allowing in play, nature, creativity, dreams, and flow in order to achieve prosperity. Fresh air and nature are such immediate energy rebalancers, and yes, even though it’s winter for many of you, that doesn’t matter! You still need it. Make time to get outside (bundle up first if need be, that doesn’t matter) without any distractions such as mobile devices, phones or headsets, and allow yourself to release some stress. Walk, play, enjoy being outdoors. Breathe and let go of tension, worry, sorrow, stress. That will open some space in you, as stress and stress related constrictions release. It literally makes space in your energy field to do this! That in its turn will allow the blooming of creative inspiration and will allow hidden or half aware ideas to surface for you to run with. When we are stressed and constricted, we can’t see our options, our other choices., or way out of something. The energy is jut too tight around us for anything to open or surface to be seen. When we get outdoors, that begins to shift, and you then naturally begin to re-engage with your intuition and your creativity. You are always either in flow — open, breathing, creative, intuitive, manifesting what you want, or in resistance — constricted, not breathing, stuck, spinning, “out of options”. Flow is abundance and prosperity. Resistance is not flow. Being in flow is an allowing, an incoming of clean clear inspirational energy into the opening you create by relaxing, creating, breathing, following your intuitive flow to do or to NOT do something. Flow is filled with prosperity and abundance! Getting outside into nature is one of the best ways to come naturally, and quickly, back into your flow. So get out there, ok? And breathe. Relax. Receive. I love to say: “I am open to receive” when I am opening myself to the possibility and flow of more prosperity into my life.